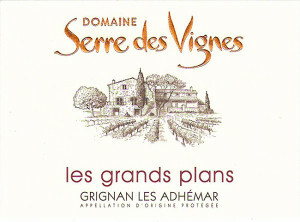 The Grignan-Les Adhemar AOC (previously Coteaux de Tricastin) is the northernmost wine-growing AOC in the southern area of the Rhone wine region of France. The wines are produced in 21 communes in the department of Drome on the east bank of the Rhône River in a triangle bounded by Saint-Paul-Trois-Chateau , Montelimar, and Grignan; opposite the Cotes du Vivarais AOC on the right bank. The Domaine in its current form was created in 1994 by the youthful and intense Jerome Roux, following in the footsteps of two preceding generations of winemakers, who were also heavily involved in the production of fruit. Jerome was joined by his cousin Vincent shortly after finishing his wine studies. Since then they have not looked back. By 2003 they were receiving regular plaudits for their wines and creating some 250 hectoliters of wine per year. The Rouxs have been at the forefront of increasing the quality image of the appellation. Maceration by a slow temperature control with smooth power cuts to preserve the fruit, maceration for 15 days. Then aged in stainless steel. Beautiful intense garnet color. The nose is rich and complex, with spicy, peppery notes of plum, black cherry, refolded few notes. The palate is soft, drinkable round, the tannins are melted to a fresh wine, and round. By its fruity and elegant wine that will accompany you throughout the meal. It goes particularly well with your liver cakes, curd Drome, guinea fowl, grilled meats, veal meatballs, and other salads. This wine is drunk young on the fruit.